As always I look at kits for off the page items, and see if the pieces would suit my scrap pages, and the add on kits for the Celebration banner kit are perfect for this!! You get some super cute 6x6 patterned paper, some great journalling stickers, some tissue (great to use with the new Fringe scissors), and a great sewn garland! All perfect for scrapbook pages. 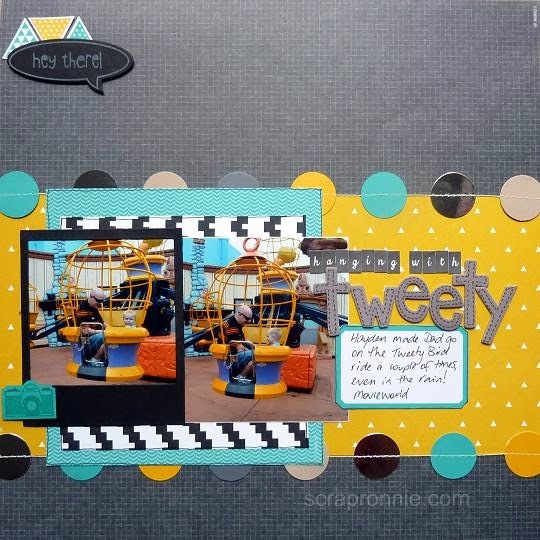 Here I have teamed up the Bermuda Bay add on with the Kaleidoscope range of DSP to make this funky layout! Materials: Bermuda Bay Celebration Add-On Kit (133432), Kaleidoscope DSP (132995), Peachy Keen stamp set(133110), On Film Framelits (132969), Geometrical stamp set (133158), Triangle punch (133375), Just Sayin'stamp set (133200), Word Bubbles Framelits (132968), White Staz On (106960), Bermuda Bay (131171) and Crushed Curry ink (131173), Bermuda Bay (131286), basic black (121688) and Whisper White (106549) cardstock, random letters from my stash. And I have big news just in! My first all day scrap/craft day will be on 12th April from 9am-5pm. Held at the Uniting Church Activity Center at Kallangur this will be a super fun day to come and craft and chat! More details coming soon, or contact me for information now! p.s. kits will be available to pre purchase for the day, and the layout above is created from one of them!